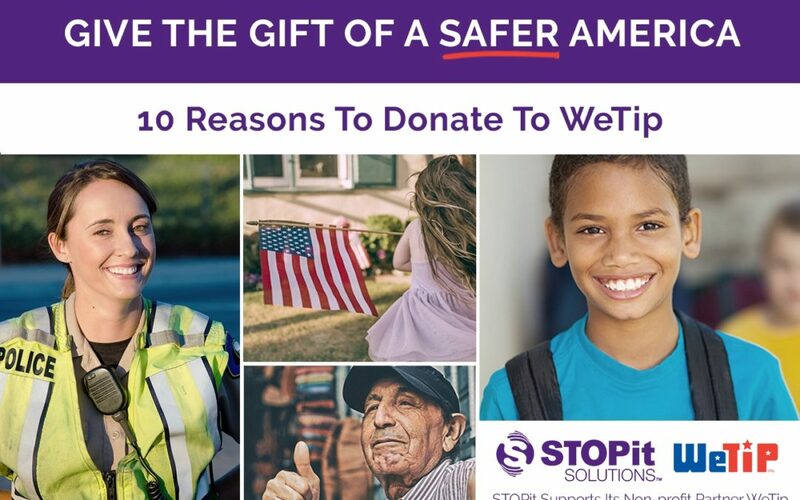 10 Reasons Why You Should Support WeTip, the Crime Stopping, Anonymous Tip Service This Holiday Season | WeTip, Inc. Founded in 1972 by a retired San Bernadino county sheriff who envisioned a better way for everyday citizens to report crimes, he understood the value of a service that was truly anonymous. Now 46 years later, boasting over 1,336,138 crimes reported, 16,391 arrests, a phenomenal 8,396 convictions, and NOT ONE informant ever revealed - the success and longevity of WeTip is proof that when good people are brave, motivated, and get involved, they can make a difference! WeTip is a 501(c)(3) non-profit organization that has relied on donations from people like you to keep their hotline running for over 46 years--and the results are astounding. More than ONE MILLION crimes have been reported resulting in nearly 9,000 convictions -- that’s how citizen-supported, citizen action works. But while WeTip is a nationwide service, they receive no federal funding. You can donate with confidence knowing that your funds are not being handled by a middle man, but all support goes directly into this secure, established resource that is protecting communities, children, the elderly, animals, and the environment. Your donation directly impacts America’s youth: WeTip is combating bullying and terror on the front lines in our schools. This year alone, WeTip has received over 90 reports of bullying, and aided in the prevention of school attacks. When school districts partner with WeTip, it does more than just empower individuals with information to speak up - it is also a powerful deterrent. It causes someone to think twice before engaging in unacceptable conduct. In fact, schools that use WeTip find that the service discourages harmful or inappropriate behavior from happening in the first place. The deterrent factor resulted in a decrease in crime in one of WeTip’s school districts by an astounding 90%. One of the areas that WeTip has been the most successful is the war on drugs. Approximately 75% of the tips the hotline receives are drug related. Over $340,000,000 in drugs and $6,875,000 in cash has been seized because of WeTip information, and they have intervened in countless threatening and dangerous situations. The numbers show the impressive impact the WeTip solution is having on breaking down the dangerous code of silence. The dramatic increases in the number of tips received each year demonstrates the change in culture and attitudes about reporting unsafe behaviors and situations. Donating to this important work directly affects communities in need, and innocent children who are exposed to this culture. The best technology for the best results: WeTip leverages mission-critical tech tools to deliver results and stay effective. WeTip’s success as a national resource depends on the ability to be available 24/7 - 356 days a year and to deliver on its promise of anonymity when citizens do report crime tips. For 47 years, WeTip has devoted a significant share of its resources to its tipline and reporting systems. In 2019, the number one operational need is an upgrade to their digital infrastructure. This upgrade will insure that individuals and communities continue to have access to this invaluable service while delivering on WeTip’s promise of anonymity for tipsters. ANONYMOUS: And this is important -- WeTip is truly anonymous, not just "confidential”. What’s the difference? Confidential means that someone knows your name and promises not to tell, until they are subpoenaed. Anonymous means that nobody knows who you are and there is absolutely no way to find out. WeTip has no taping, tracing or caller ID. They have no way of knowing who the caller is. There are rewards for getting involved and doing the right thing. Every tipster is offered the opportunity to receive a reward up to $1000 (with some higher rewards offered in specific instances) for information leading to arrest and conviction. These rewards are paid through WeTip's anonymous and unique reward payment system. This is the only program of its kind in the nation, and honors the fact that though many people will choose to remain anonymous for their own reasons, when people can and do come forward, they deserve recognition for taking positive action. In fact, the rewards program is extremely effective in encouraging otherwise hesitant folks to make that call, and the rewards -- more than $1M and counting -- are only made possible by donated funds. Knowledge is power. WeTip is only helping if people know to use it. Your donation to WeTip not only helps to keep their day-to-day operations possible, but it also helps with the communications, public relations and marketing efforts -- all necessary to increase public awareness of the hotline and ensure that everyone who needs WeTip knows about WeTIp, and how to take safe, positive action against criminals and other threats to health and wellbeing. We live in an era where we no longer have the luxury of looking the other way, or expecting someone else to be responsible and do the right thing, so “If you see something, say something” by calling WeTip's Hotline at 1-800-78-CRIME.